The street of the city, former route of Agrippa, is located in the district of the city, specifically in the walled part of the Augustobona Tricassium Gallo-Roman town (castrum), whose rampart was built during the second half of the third century. AD to protect the city from the Germanic invasions. The stone is scarce in the region, that of Roman buildings was reused to raise a bulwark of about 400 square meters of side. These walls are home to the Christian heart of the city and the castle of the Counts of Champagne first (current site of the Place de la Tour). 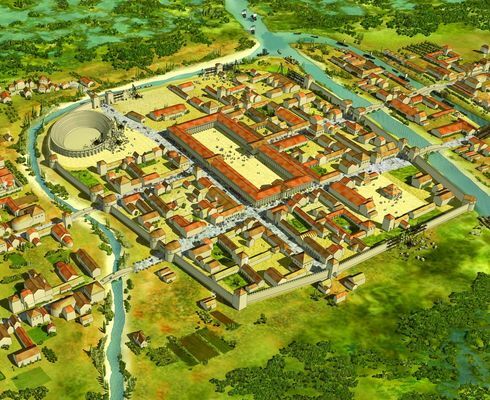 The city is crossed from east to west by decumanus maximus (now rue de la Cité, the level is higher then 3 m) and from north to south by the cardo maximus (current rue de la Tour and Street Boucherat). There is no review about La Rue De La Cité - Ex Voie D'agrippa, be the first to leave one !